I have done several posts recently which have touched on VMware Virtual Volumes (VVOLs). Now that the dust has settled, I wanted to do a more detailed post to put all the pieces together and answer all the questions you may have about VVOLs and its function with 3PAR. Today we take a LUN centric approach to storing VM’s in vSphere. On a 3PAR system you would create a virtual volume, then export this to your ESX hosts as a VLUN, this VLUN would then be formatted within vSphere with a VMFS file system to form a datastore. 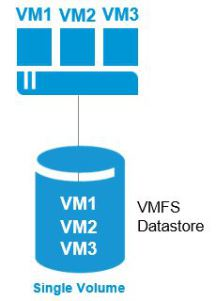 The diagram below represents the present situation, with a single LUN formatted as an VMFS datastore containing multiple VM’s. This is the way we have been working for years so what’s the challenges with this LUN centric approach. So what we need is something more granular, that workers closer with the storage to expose its capabilities and allows the VM’s to define their storage requirements in a policy driven manner. Well, with the launch of vSphere 6 and VVOLs, that’s exactly what we have got. The VVOLs created on the 3PAR have a one to one relationship with the disks created in the VM, so for example if you create a VM with 2 VMDK disks, two VVOLs will be created on the 3PAR to represent these. These VMDK VVOL’s are called data VVOLs. On top of this you also have Config, MEM, Other, and SWAP VVOL types to represent the other files that make up a VM. The diagram below shows the one to one mapping between VVOLs and VM’s. This one to one relationship between VVOLs and backend storage does away with the need for a VMFS system, with the VMDK effectively sitting directly on the storage. The building block within which all VVOLs must sit is called a storage container. A storage container is a logical construct on the storage system in which VVOLs with similar characteristics are placed. A minimum of one storage container is required and as initially the 3PAR only supports one storage container there are no great decisions to be made here. 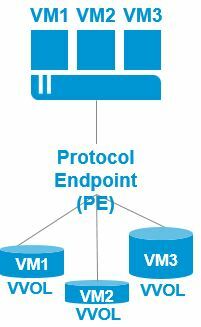 Protocol end points are the logical access points that enable data path communication between the storage system and vSphere. All communications to VVOLs will not be direct to the VVOLs themselves but via the protocol end point. To summarise a separate container is created for each file type that makes up the VM direct on the storage as a VVOL, the VVOLs are grouped together in a storage container, communications to the VVOL is via the storage end point and the capabilities of the array are exposed via VASA. Policy driven – When creating the VM administrators can choose the class of service they require from the storage for each disk. For example a VM disk housing a database could be set to use flash disk that supported replication and snapshots whilst a disk from the same VM only used for backups could sit on NL disk with no additional features. The good news for 3PAR owners is that HP have been working with VMware on VVOLs since day 1, the 3PAR was actually the reference device for Fibre Channel and VVOLs, so has undergone extensive testing. Whilst some vendors will require additional installs to accommodate VVOLs 3PAR has it baked into the code and will be available to all those running the 7000 and 10,000 systems with 3PAR OS 3.2.1 MU2. VVOLs are included with vSphere 6 which is expected in quarter one of 2015. To read more about how 3PAR and VVOLs will work together check this post and also this post which deals with requirements for VVOls. The only thing I think HP will have to review is their naming convention for LUN’s. I think they are going to have to admit defeat with both themselves and now VMware using the term virtual volumes. Eric Siebert VMware VVOLs is coming. Will your storage be ready for it? HP 3PAR StoreServ will be! 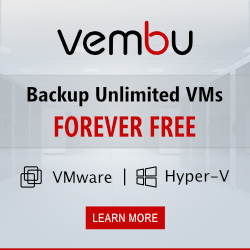 Hi, I assume another advantage with vVOLs, is that you don’t have to shutdown your VM to extend a vmdk which is above 2TB as the limitation is now determinded by the storage array and not VMware. Is this correct? The number of VVOLs that can be supported is determined by the storage. 3Pardude – correct me if I am wrong, but the one thing that NO ONE has said or talked about yet that I’ve seen in regards to 3Par and VVols (including HP), is virtual machine snapshots. If I’m not mistaken, vSphere 6 when used in conjunction with VVols offloads all VM snapshots to the 3Par to handle as array based snapshots. The last time I checked, array based snapshots are not part of the the base 3Par Operating System Software Suite license. Therefore, while you can enable VVols with vSphere 6 and 3Par, unless you have a Virtual Copy license, you lose the ability to take VM snapshots with vSphere 6, 3Par, and VVols. This will be a show stopper in my opinion in the adoption of VVols if my licensing assumptions are correct. Good question. Check out P7 of the VVOL white paper, http://h20195.www2.hp.com/v2/GetPDF.aspx/4AA5-6907ENW.pdf. A virtual copy ie snapshot licence is required in order to implement VVOLs. How many vVols can you create inside a storage container? Is there a max limit? Any hints you can give to troubleshoot the PE not being present from host side? The VASA part is online but the host dies not see the PE. I would check through SPOCK first and make sure everything in your environment is supported, especially the HBA in the hosts. I am trying to find out how vvols work in conjunction with AO. In VMware I am asked to create my 3 tiers of storage via storage policy. This seems to work against AO. Am I missing something? I reached out to @ericsiebert on this one. He has confirmed that AO is supported. It was a little disconcerting that I couldn’t see the container via the mgmt console at the time as well (granted I could see if via the cli) I think they’ve fixed this in the newer mgmt consoles but from what I heard the reporting isn’t fully there yet. It’d be nice if HP/vmware posted the limitations that certain vvol implementations had. It took me digging all over the place to get a straight answer and even then it was best guesses. 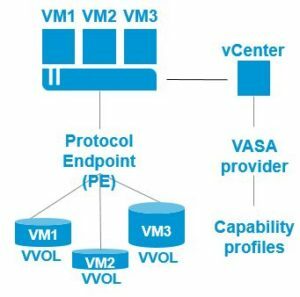 Just wondering if anyone knows if it’s possible/supported to connect more than 1 vCenter to 3PAR VASA? I’m migrating from vSphere 6 – 6.5 and have deployed a new vCenter 6.5 rather than upgrade… I have 1 mission critical VM running on a VVOL.